Posted in 2014 Favorites, Avast Ye Bilge Rats Pirate Challenge, challenge, Mainstream Polish, Manicures, Nail Art, pictures	by Jessica W.
Avast, ye scalawags! 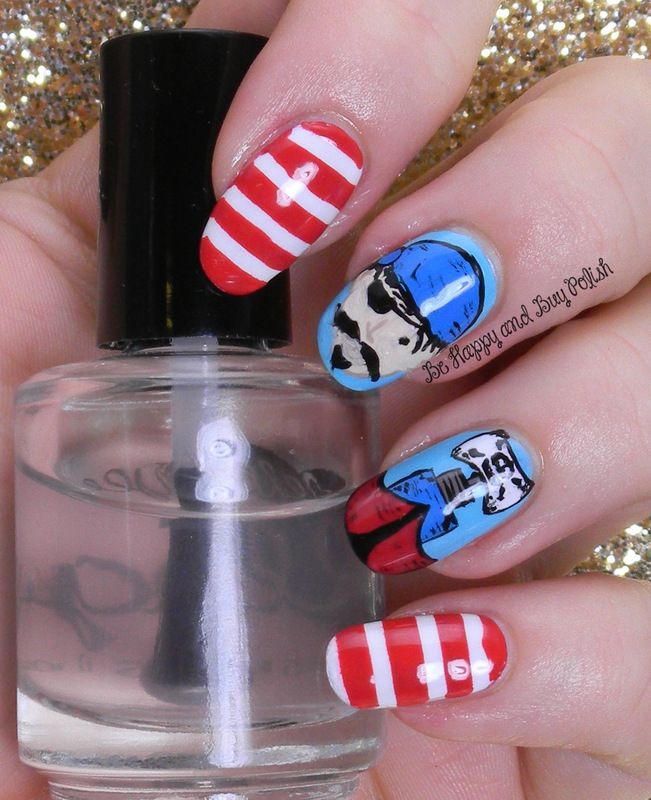 It’s the last day of the Avast Ye Bilge Rats Pirate Nail Art Challenge, and International Talk Like a Pirate Day! I be excited t’show you me nail art. 🙂 But first, if ye missed any of me manicures this week, check them out: Sea Creature nail art, Ocean nail art, Treasure nail art, Treasure Map nail art. This day be t’ freestyle (or re-create) part o’the challenge. I found an image of a pirate cake and I wanted to riff off of that. What be a pirate challenge without a scurvy pirate and his ship? The blue base on my middle and ring fingers is Wet n Wild Teal Slowly and See. In no particular order: Wet n Wild Black Creme, Blank Canvas (white), Red Red, Listening to Blue Reed (darker blue), Cement (grey/brown), OPI My Vampire is Buff and OPI You’re So Vainilla. I be knowin’ me pirate’s mouth is a little funky but I kept trying to fix it and it wasn’t working so I just stopped. LOL. On my other hand, I did all skulls (though I didn’t get a picture of it). This looks seriously amazing! Fantastic job Jessica! Incredible work! You continue to amaze me. Arr, yer detail work be stunnin’, me beauty. Thar be good odds th’ ship’ll sail off on its own, I says! Oh super cute! I love your pirate guy! Such awesome pirate nails these are. Your free handed skills are great! Oh wow! I’m LOVING the detail on the pirate and the ship!! Gorgeous job! Ahhh Jessica!! This is so great 😀 You are blowing me away with your nail arting skills lady! Oh thank you Stefanie, but you’re not too bad yourself, you know! omg your attention to detail is amazing!!!!!! Holy amazing! Those look great! This is so freaking amazing Jessica! Love love love it! OH MY GOSH I can’t get over this. AMAZING work! Simply amazing, like a painting but better! Woooow! You’re such a great arrrrrrrrrrrtist 😉 I just love the detail on your pirate & his ship! Your freehand is gorgeous, Jessica! And I LOVE the perspective on that ship! Awesome job! Love this!!!! Probably my favorite that you did for the whole challenge!